Congratulations to the Outer Banks Daredevils, your 2018 Postove Cup Champions. 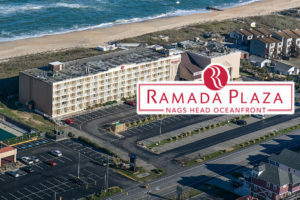 The Outer Banks Daredevils faced the Virginia Beach Waves in today’s championship game, held at Virginia Wesleyan University, and celebrated their 20th anniversary season with their 6th summer league championship. Scorekeepers were kept busy today during a high-scoring contest between Daredevils and Waves where Waves lost 12-8. Daredevils fired up the offense in the second inning. Reid Zitzelberg singled on a 1-1 count, scoring one run. After Daredevils scored two runs in the top of the sixth, Waves answered with two of their own. Daredevils scored when Ben Closson grounded out, scoring two runs. Waves then answered when Johnson singled on a 1-1 count, scoring one run and Waves scored one run on a stolen base. Daredevils took the lead for good with six runs in the fifth inning. In the fifth Closson singled on a 0-2 count, scoring two runs, Zitzelberg singled on a 1-0 count, scoring one run, Ryan Creps doubled on a 2-1 count, scoring one run, and Payton Holdsworth singled on a 1-0 count, scoring two runs. Ryan Allen took the win for Daredevils. He surrendered seven runs on 11 hits over six innings, striking out four. Cole Taylor and Daniel Petr entered the game out of the bullpen and helped to close out the game in relief. Jarrett Hyder took the loss for Waves. He allowed 13 hits and seven runs over five innings, striking out six and walking one. Waves hit three home runs on the day. Brooks Carr went deep in the fourth and fifth innings. Caleb Ward had a four bagger in the second inning. Waves collected 12 hits. Zachary Spradlin, Ward, Daniel Petro, Carr, and Johnson each managed multiple hits for Waves. Johnson, Carr, Petro, Ward, and Spradlin each collected two hits to lead Waves. 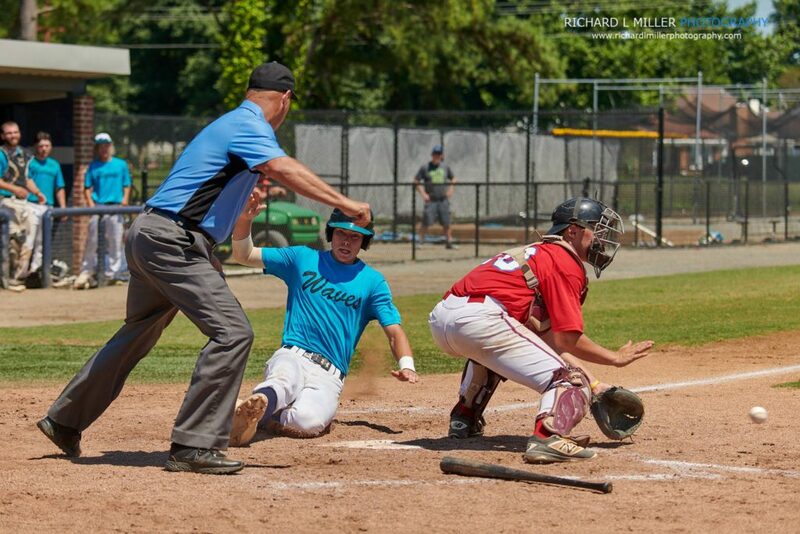 Waves tore up the base paths, as two players stole at least two bases. Angelo Spataro led the way with two. Waves was sure-handed in the field and didn’t commit a single error. Spradlin had the most chances in the field with eight. Daredevils scattered 17 hits in the game. Russell Mistretta, Ryan Creps, Andrew Kasiski, Reid Zitzelberg, Kyle Strovink, and Payton Holdsworth each collected multiple hits for the Daredevils. Daredevils was sure-handed and didn’t commit a single error. Kasiski made the most plays with ten. 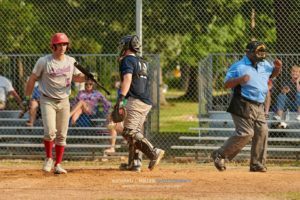 Daredevils ran off with the lead late in the game in a 5-4 victory over Shredders on Monday. The game was tied at three with Daredevils batting in the bottom of the seventh when Ben Closson singled on the first pitch of the at bat, scoring two runs. Daredevils got things moving in the second inning, when Stephen Polansky hit a solo homer. Frank Arnold pitched Daredevils to victory. He lasted one and two-thirds innings, allowing five hits and three runs. Michael Gabriele threw one and one-third innings in relief out of the bullpen. 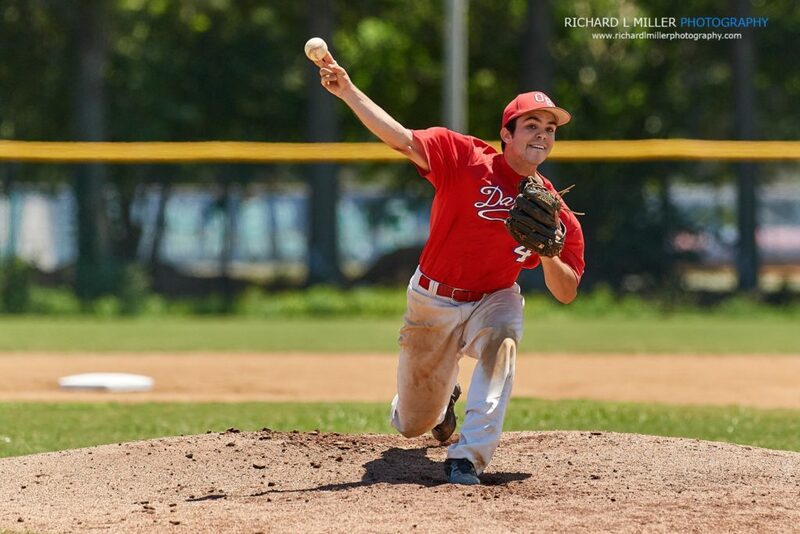 Gabriele recorded the last four outs to earn the save for Daredevils. Jackson Sanchez took the loss for Shredders. He surrendered two runs on two hits over one inning. Daredevils tallied one home run on the day. Polansky went for the long ball in the second inning. Daredevils totaled nine hits in the game. Gabriele and Polansky all managed multiple hits for Daredevils. Gabriele went 3-for-5 at the plate to lead Daredevils in hits. Daredevils didn’t commit a single error in the field. Kyle Strovink had the most chances in the field with seven. Shredders tallied 11 hits on the day. 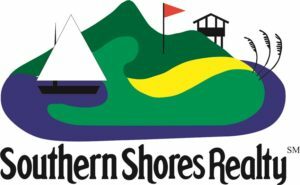 Jared Jordan, TJ Wynkoop, and Drew Latham each collected multiple hits for Shredders. Shredders didn’t commit a single error in the field. Evan Leveroni had seven chances in the field, the most on the team. 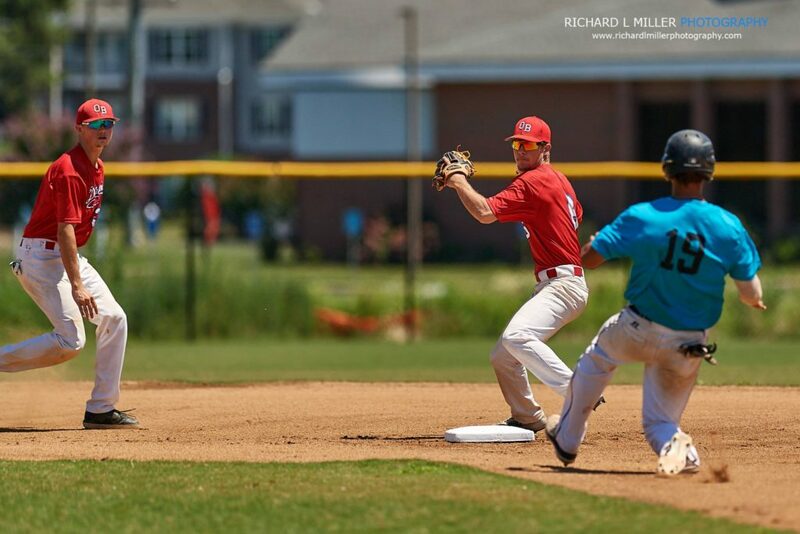 The Outer Banks Daredevils went 2 – 0 in their bracket, defeating the Lakewood Legends 15 – 2 and the Portsmouth Sea Monsters 7 – 2, advancing to the Final Four, where they will face the Virginia Beach Shredders today at 4:00pm at Virginia Wesleyan University. Legends watched the game slip away early and couldn’t recover in a 15-2 loss to Daredevils on Saturday. 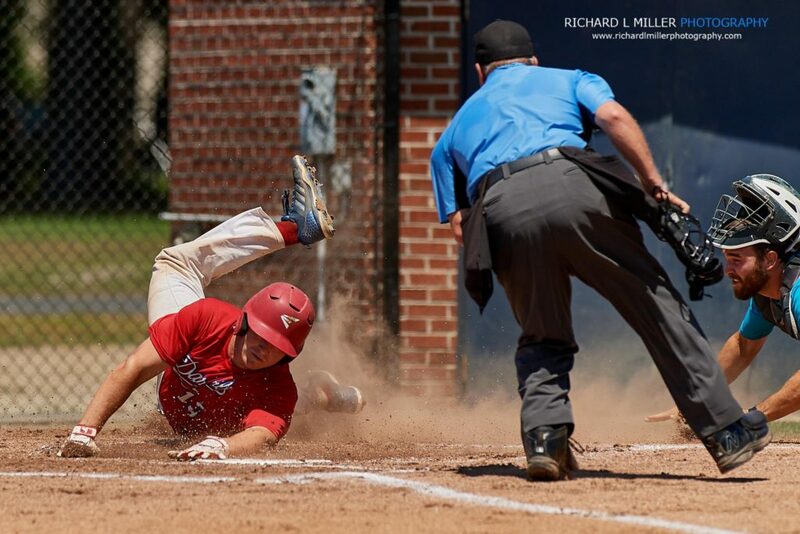 Daredevils scored on a double by Stephen Polansky in the first inning, a single by Ben Closson in the first inning, a sacrifice fly by Andrew Kasiski in the second inning, and a sacrifice fly by Polansky in the second inning. The Legends struggled to put runs on the board and had a tough time defensively containing Daredevils, giving up 15 runs. Daredevils got things moving in the first inning, when Polansky doubled on a 2-0 count, scoring one run. Daredevils scored five runs in the eighth inning. Daredevils’s big inning was driven by singles by Kasiski and Closson, a sac fly by Zach Herring, and a double by Kyle Strovink. Glen Pizzanello took the win for Daredevils. He lasted five innings, allowing three hits and zero runs while striking out five and walking zero. Cole Taylor and Payton Holdsworth entered the game out of the bullpen and helped to close out the game in relief. Ryan Rhodes took the loss for Legends. He allowed 13 hits and nine runs over three and two-thirds innings, striking out four. Legends racked up nine hits. Derek Dickerson, Zach Teegen, and Liam Conroy all had multiple hits for Legends. Conroy, Teegen, and Dickerson each collected two hits to lead Legends. Daredevils collected 24 hits on the day. Kasiski, Michael Gabriele, Strovink, Ryan Creps, Damian Hairston, Closson, Russell Mistretta, and Polansky each had multiple hits for Daredevils. Andrew Kasiski had the hot hand on Sunday, tallying four hits and leading Daredevils to a 7-2 victory over Sea Monsters. Kasiski homered in the first, singled in the third, singled in the fourth, and singled in the sixth. Daredevils got things moving in the first inning. Kasiski hit a solo homer. Thomas Packert earned the victory on the hill for Daredevils. He allowed three hits and two runs over nine innings, striking out 13. Michael Portela took the loss for Sea Monsters. He surrendered three runs on eight hits over five innings, striking out six. Daredevils tallied three home runs on the day. Russell Mistretta had a long ball in the eighth inning. Ryan Creps had a four bagger in the fourth inning. Kasiski put one out in the first inning. Daredevils saw the ball well today, racking up 12 hits in the game. Kasiski and Payton Holdsworth all had multiple hits for Daredevils. Kasiski led Daredevils with four hits in five at bats. 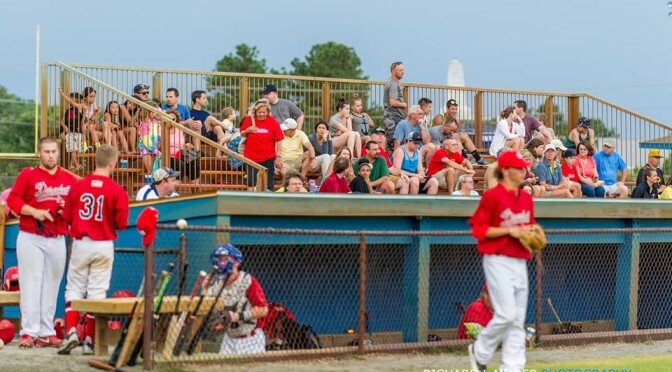 The Daredevils will be taking on the Virginia Beach Shredders today, July 9th at 4:00pm at Virginia Wesleyan Univeristy’s Perry Field. 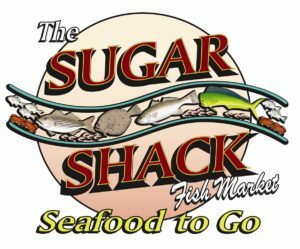 Admission is free to the public, coolers are allowed, no glass bottles. 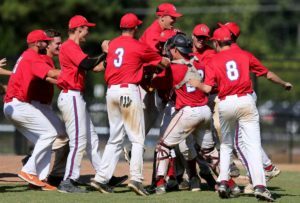 The Outer Banks Daredevils finished the 2018 regular season with the best overall record (16-6) and head into the post season as the number one seed. 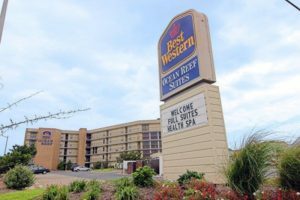 The Daredevils will play in Bracket A during the round robin portion of the post season tournament, facing the Lakewood Legends (12-9) and the Portsmouth Sea Monsters (17-7). The top team from each bracket will advance to the Final Four. 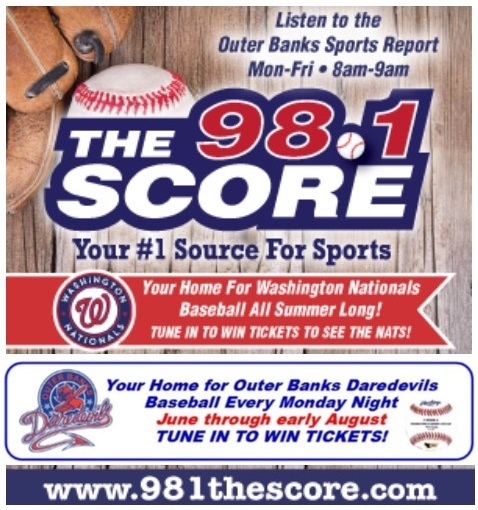 Daredevils fans, here is your chance to catch the Daredevils only game south of the VA boarder for the 2018 season. 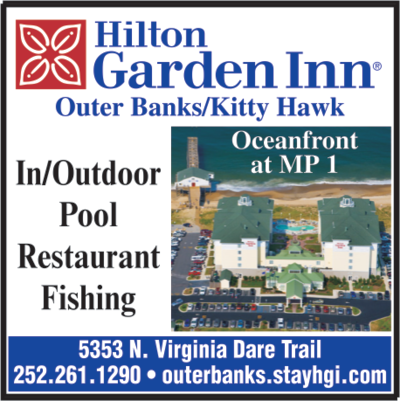 Tuesday, June 26th, the Outer Banks Daredevils will be taking on the Greenbrier Knights in this Tidewater Summer League game. 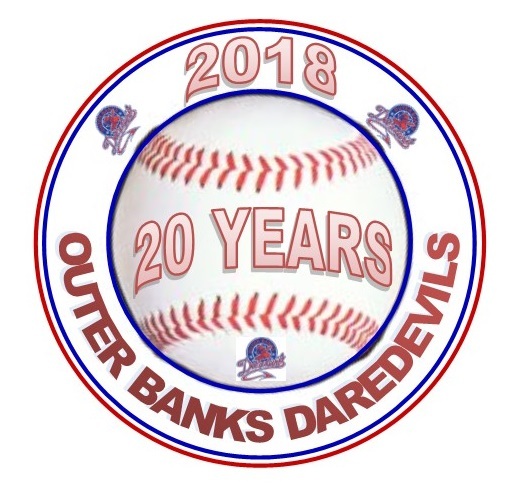 First pitch is scheduled for 3pm, so make plans to visit beautiful Ocracoke Island on Tuesday, 6/26; and come out and support your Outer Banks Daredevils. 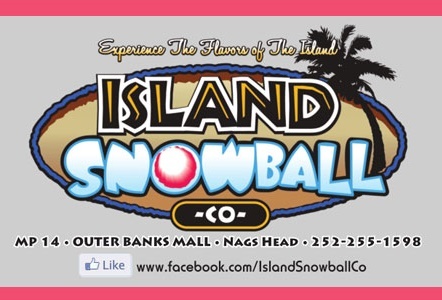 This event is a charity fundraiser supporting Ocracoke Island Park and their youth sports programs. 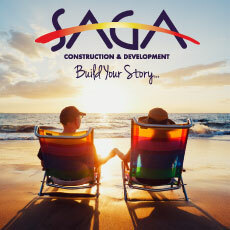 Tickets will be available at the front gate. 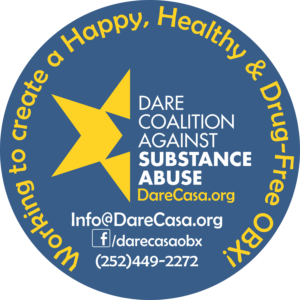 The Daredevils are presented by the Dare Coalition Against Substance Abuse, Dare CASA and sponsored in part by Southern Shores Realty, our Grand Slam Partner. A walk-off double led Daredevils past Seagulls 7-6 on Thursday. Daredevils trailed 6-5 in the bottom of the seventh inning when Cole Hobby doubled on a 0-1 count, scoring two runs. Bats blistered as Daredevils collected nine hits and Seagulls tallied eight in the high-scoring game. Daredevils fired up the offense in the second inning, when Reid Zitzelberg’s sac fly scored one run for Daredevils. In the top of the sixth inning, Seagulls tied things up at four when Emmanuel Gonzalez singled on a 0-2 count, scoring one run. Seagulls scored three runs in the sixth inning. The big inning for Seagulls came thanks to a single by Gonzalez and a double by Michael Petrie. Frank Arnold pitched Daredevils to victory. He lasted one inning, allowing zero hits and zero runs while striking out two and walking one. Glen Pizzanello, Cole Taylor, and Kole Register all put in work in relief out of the bullpen, steering their team towards the victory. Gonzalez took the loss for Seagulls. He surrendered three runs on one hit over two-thirds of an inning, striking out one. Daredevils scattered nine hits in the game. Michael Gabriele, Kyle Bayles, and Hobby each racked up multiple hits for Daredevils. Hobby, Bayles, and Gabriele all had two hits to lead Daredevils. Seagulls collected eight hits. Gonzalez, Andrew Poirer, and Nicholas Simonenko all collected multiple hits for Seagulls. Seagulls was sure-handed in the field and didn’t commit a single error. Simonenko had the most chances in the field with seven. 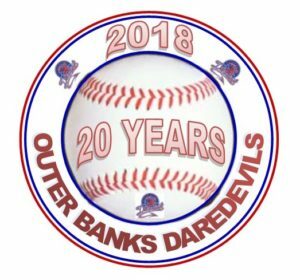 The upcoming 2018 season of Daredevils Baseball will be the 20th summer of collegiate baseball in the OBX. 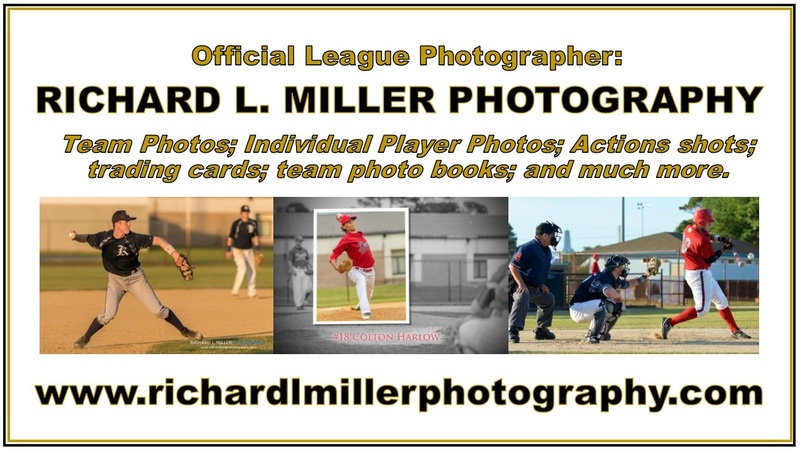 Plans are being made to make 2018 the best season yet, and we are asking our sponsors & fans for your continued support of the Daredevils, as we celebrate 20 seasons of exciting, collegiate, summer baseball.